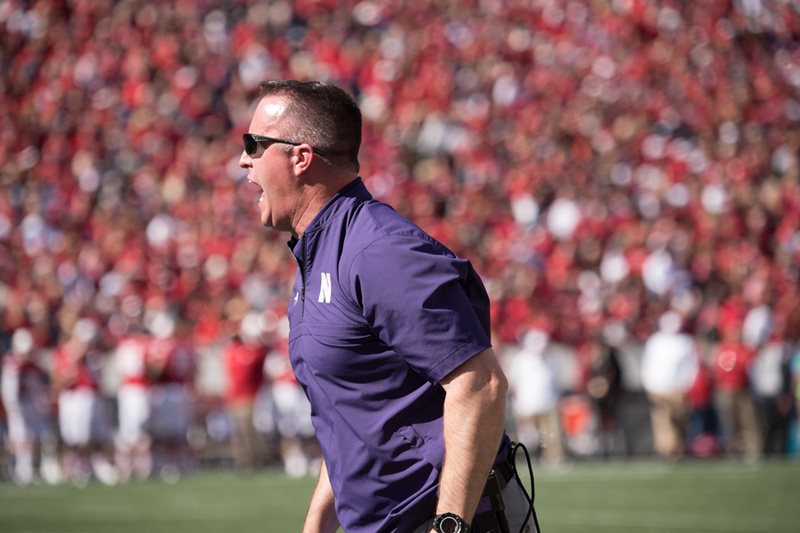 Coach Pat Fitzgerald yells. Like many Northwestern teams, his squad is off to a rough start this season. While we focused our attention on Madison this weekend, something important happened elsewhere. On the pitch in West Lafayette, Purdue beat Northwestern’s women’s soccer team 2-0, effectively ending the Wildcats’ chances to repeat as Big Ten champions. In a brutal weekend for NU sports, a field hockey win over No. 19 Rutgers was the only positive takeaway. Clayton Thorson and the Cats got beat down by Wisconsin, the volleyball team lost to No. 4 Penn State and men’s soccer dropped its fifth straight conference match. This should come as no surprise, but NU is still not very good at sports. And the Cats are quickly running out of excuses. You’ve had the conversation a million times: Northwestern is too focused on academics to be good at sports, Northwestern is too small to compete with other Big Ten schools, Northwestern doesn’t have the facilities to rival elite competition. Suddenly, though, none of that is true. Within the year, the Cats will have the most expensive athletic complex in the Big Ten. Ryan Fieldhouse, overlooking Lake Michigan, will put competitors’ facilities to shame. And Evanston is already a prime recruiting spot, so theoretically, top athletes from the Chicago area should always be interested in NU. And in non-revenue sports, the issue is more glaring. It’s gospel that schools with higher academic pedigrees have a recruiting advantage in non-revenue sports, because student athletes without professional aspirations gravitate toward academic powerhouses. Yet NU consistently lags behind Stanford and Duke — schools with comparable academic pedigrees — in fielding elite recruits. So what’s to blame for the lack of five-star talent across the board? It’s hard to blame coaches; Pat Fitzgerald is an Evanston legend and Chris Collins has already left a positive impact on the men’s basketball program. Either those two are receiving far too much credit, or we have to move on to a different excuse. There are bright spots, of course. Women’s golf finished second in the country a season ago, men’s basketball went to the tournament for the first time and baseball made a miraculous run to the Big Ten Tournament title game. But maybe that’s the problem. Maybe we shouldn’t be celebrating cinderella runs or shocking upsets. If you consistently look at yourself as the underdog, you become the underdog. And the only way to change that is to go into every game, match, meet or tournament expecting to win. When Trace McSorley, Saquon Barkley and No. 4 Penn State visit Ryan Field on Saturday morning, they’ll be expecting to win. NU will probably lose, and most people will leave unsurprised. But going forward, expectations need to change. We’ve run out of excuses for mediocrity. Jonah Dylan is a Medill sophomore. He can be contacted at jonahdylan2020@u.northwestern.edu. If you would like to respond publicly to this column, send a Letter to the Editor to opinion@dailynorthwestern.com. The views expressed in this piece do not necessarily reflect the views of all staff members of The Daily Northwestern.